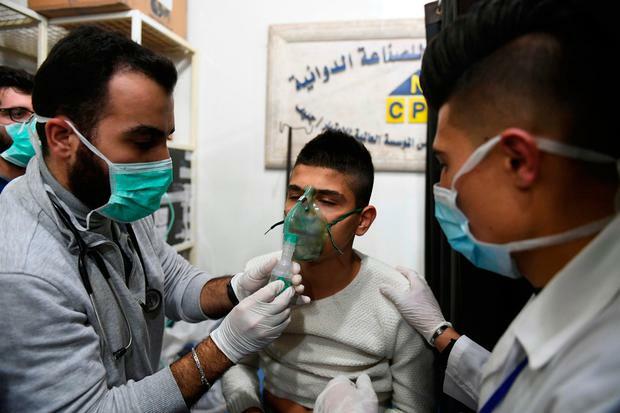 Russian warplanes attacked rebel-held areas in northern Syria for the first time in weeks after more than 100 people were treated at hospitals for a suspected poison gas attack in Aleppo. The rebels, who have denied carrying out any poison gas attacks, accused the government of trying to undermine a truce reached by Russia and Turkey in September during a summit in the Russian city of Sochi. The targeted area is rebel-held and home to extremist groups opposed to the truce such as the al-Qa'ida-linked Horas al-Din - which has described the deal as a "great conspiracy" - and the Ansar al-Din Front. Russian military spokesman Igor Konashenkov said in Moscow that Russian aircraft destroyed militant positions in northern Syria and blamed them for the gas attack on Aleppo. The latest wave of shelling and air strikes in northern Syria is the most serious violation of a truce reached by Russia and Turkey that brought relative calm to the country's north for the past two months. "The planes of Russia's Aerospace Defence Forces carried out strikes on the detected artillery positions of terrorists in the area, from where the shelling of Aleppo civilians with chemical munitions was conducted late," said Major General Konashenkov. The UK-based Syrian Observatory for Human Rights and the Thiqa News Agency, an activist collective, said air attacks pounded rebel-held areas west and south of Aleppo city. The strikes were the first since the truce went into effect on September 17. Syria's Arab News Agency, SANA, said Syrian troops pounded rebel positions near Aleppo "inflicting heavy losses among terrorists". SANA said the alleged chemical attack was carried out late on Saturday by "terrorist groups positioned in Aleppo countryside" which fired shells containing toxic gases on three neighbourhoods in Syria's largest city. Human Rights Watch's deputy director for the Middle East and North Africa, Lama Fakih, said "serious reports of suspected chemical weapon attacks should not be left without investigation". She added that all parties, including the Syrian government and Russia, should facilitate a probe by the Organisation for the Prohibition of Chemical Weapons. Maj Gen Konashenkov said Russian chemical weapons specialists had gone to Aleppo. Russia is a close ally of President Bashar al-Assad and has intervened in recent years to turn the tide of the civil war in his favour.